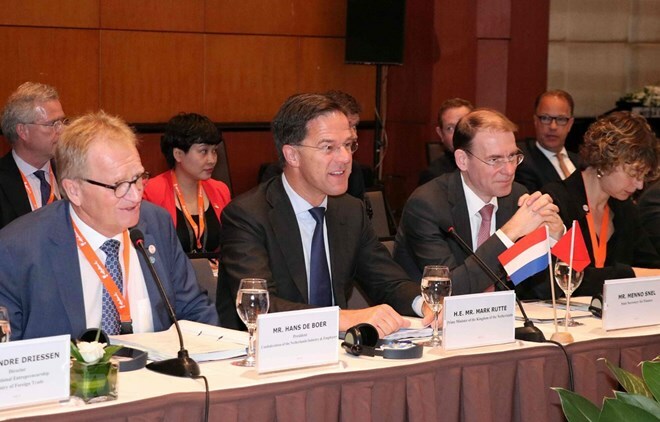 Hanoi (VNA) – Prime Minister of the Netherlands Mark Rutte and Vietnamese Deputy Prime Minister Vuong Dinh Hue attended a roundtable discussion with 70 leading Dutch businesses and senior officials of Vietnam's ministries and sectors in Hanoi on April 9. Addressing the event, part of an official visit by PM Rutte, Deputy PM Hue said that despite the geographical distance, the two countries’ trade relations date back to long time ago. In the 17th century, merchant vessels from the Netherlands reached Hoi An port in the area which is now Vietnam’s central province of Quang Nam, laying the foundation for bilateral trade ties. This is an important historical basis for the strong development of their economic links, as seen in the recent past, he said, noting that the Netherlands is currently the biggest European investor in Vietnam with the total registered capital of over 9.5 billion USD. In 2018, bilateral trade surpassed 7.84 billion USD, accounting for 1.6 percent of Vietnam’s total trade turnover and about 14.6 percent of the country’s trade with EU members. Roughly 77,300 Dutch tourists visited the Southeast Asian nation last year, making the Netherlands the fourth largest source of European travellers to Vietnam. Valuing the Dutch delegation’s visit to Vietnam, Hue considered this trip an important chance to foster investment partnership and capitalise on the sound bilateral relations. The deputy PM expressed his belief that once the EU-Vietnam Free Trade Agreement (EVFTA) is signed and takes effect, it will create new opportunities for Dutch enterprises to invest and do business in Vietnam. Therefore, he asked the government, parliament, and businesses of the Netherlands to support the signing and ratification of this deal. For his part, PM Rutte said the two governments should continue removing as many obstacles as possible so as to facilitate investment cooperation between their businesses. He also spoke highly of the Vietnamese Government’s efforts in improving the business climate, national competitiveness, and innovation indexes. He voiced his belief that bilateral economic, trade, and investment links will develop with greater strength in the time ahead. Aside from trade, both sides also share many similarities, including marine economic potential, deltas, and climate change-related challenges. As such, the 70 Dutch companies visiting Vietnam this time, which have strength in such fields as agriculture, water, and wind power, are willing to cooperate with Vietnamese businesses, the PM added.